I dabbled in the Beauty Industry for a few years while I was in college and absolutely loved the skills and knowledge I learned about applying makeup. One of my favorite Pretty Little Pastimes is doing event makeup. 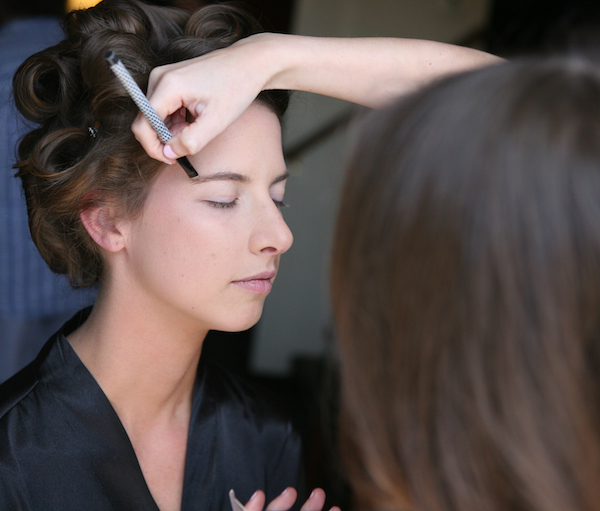 I was so honored and thrilled when one of my best friends from college asked me to be her makeup artist on her Big Day! I said “I do” to the invitation and excitedly started planning her look. Whether you are applying your own wedding makeup, or having it done by a professional, always make sure you have a clear idea and description of what you are looking for. Cut out photos from magazines, play with color combinations at home, and make an appointment for a trial run so you can test the wear time of your foundation, eye shadows, etc. 1. Start with a primer. I can not emphasis the importance of this step enough. You can’t apply the paint to your work of art without first having the right canvas. A primer acts as a filler and smoothing agent for your skin. It evens out the texture of your skin and also acts as a barrier for your pores. My favorite go-to primer is Photofinish from Smashbox. You will want to apply it evenly over the skin, avoiding the eyelids. You will want to use an eye shadow primer for your your eyelids to keep your shadows in place. My favorite is Primer Potion from Urban Decay. 2. Plan for bronzing. 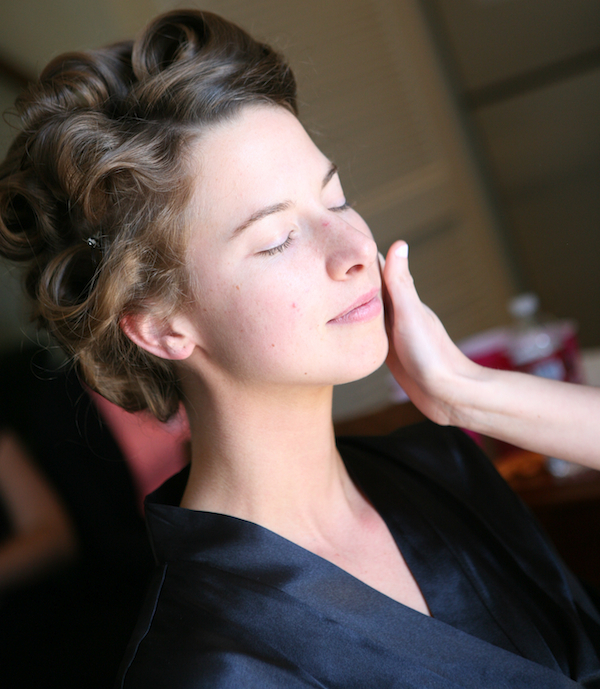 Choose a foundation formulated for your skin type and in a shade that is a match to your wedding day skin color. Often brides go tanning a few days before their wedding and forget to adjust their foundation. Make sure to let your artist know that you may be a shade or two darker than your trial run, so they know to bring multiple shades and bronzer for mixing. 3. Tame your brows. Your brows are the frame to your eyes and when you want them to be the focus, make sure your frame is polished. Use a brow powder and wax to even out your brows, accentuate their shape, and keep hairs in place. I have tried a variety of brow powders high-end to low-end and my favorites are Brow Tech by Smashbox and Maybelline‘s Brow Podwer. The Maybelline version is a steal and lasts for months. 4. Go natural with minerals. For a natural look I begin with applying a concealer under the eyes and over any blemishes on the skin. Next, I apply a layer of mineral liquid or spray foundation to the areas that need the most coverage (usually the t-zone) and blend outward. To set the look I apply a sweep of mineral powder over the entire face. Mineral powders are wonderful for achieving a natural glow without the dulling effect of regular powders. Jane Iredale has an amazing selection of mineral powders and mineral liquids for all skin types. I love their liquid and powder foundations for event makeup because they layer without creasing and can by touched up throughout the day without caking. 5. Keep your lipgloss handy. After the first kiss you will want to make sure you are ready for photos with your new husband. A little dab will refresh your look and keep you looking picture perfect. I always give the gloss to my bride to take with her so she can touch up through out the night. 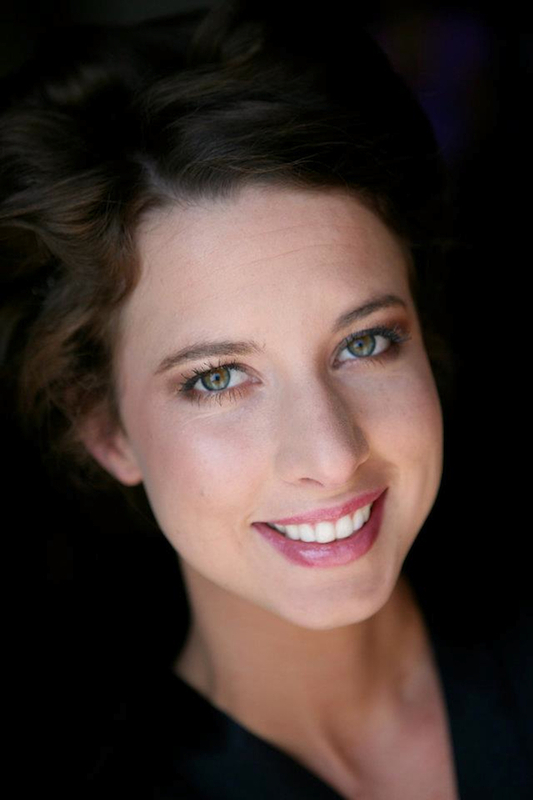 I have done a lot of makeup application over the years, but I have to say that this wedding was my favorite so far. It was such a special moment in our friendship and it is a memory that I will keep close to my heart always. What a beautiful bride!